All In Adventures is your chance to be a real-life detective. You and your team are in a room for 45 minutes and you must find clues, solve puzzles and decipher hidden codes to escape! 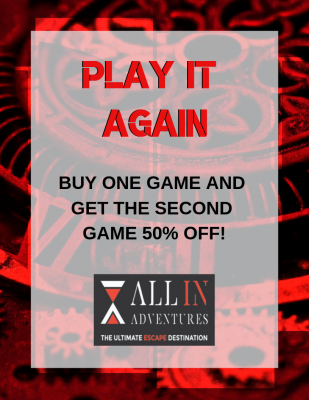 Play it again at All In Adventures! Play one game, and get the second game 50% off! Challenge your friends, try for the next level, go for the wall of fame, and go all in! Offer not valid on holidays. Offer may not be combined with any other offers or discounts. Second game must be played on the same day. No rain checks or future bookings. 50% off applicable for no more than the number of players in the first booking.